Inspired By Stamping Blog Hop. In just 2 days, you will be able to buy the newest stamp sets which will be released on January 14. 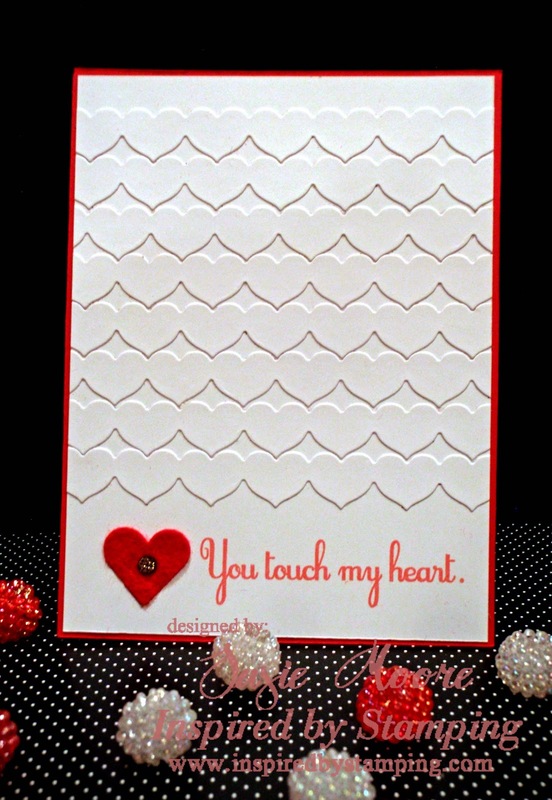 Today I've used a sentiment from one of the four new Valentine stamp sets. This set is filled with angels, hearts and sentiments. I love it. To achieve the faux embossed look, I cut eight heart border strips using a die from PaperTrey Ink. I used the same paper that I used for my card base. I attached all of the strips making sure each row touched the one above it. I used my Xyron to attach the strips because the key to this technique is that everything has to adhere perfectly. Then I added a red felt heart, a gem and my beautiful sentiment to complete the card. I hope you will try this technique because it is super fun to create and packs a punch that will have people asking you how you did it. Tomorrow I will be back with another sneak peek for you. Be sure to look at what all the designers have for you by clicking each link below. Have fun hopping and I'll see you tomorrow. Beautiful card! Love your faux embossing!! Looks great! Totally in love with this one! I just love your clean lines and beautiful faux embossing. This is such a clean and classy card Susie! Beautiful!!! Great simple and elegant card!! beautiful! I love the faux embossing! I also love the pop of color, it's fabulous! such a beautiful simple card! perfect for making multiples to!